This photo is a collaboration between Rich Richins and Scott Rosen. It is a composite of Scott's Hydrogen Alpha version, Scott's RGB (color) version, and Rich's Oxygen III data. 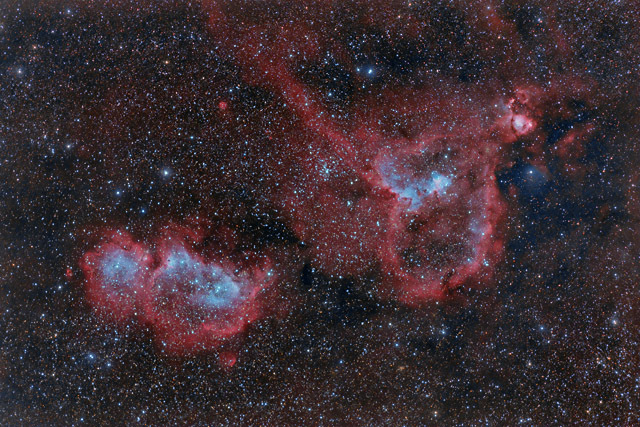 The Hydrogen Alpha data brings out the deep red nebulae throughout the image, while the Oxygen III data helps display the blue/teal colored OIII regions within the nebulae. The RGB color data is used to provide natural color to the stars and reflection nebulae within the image. Notes After posting my HaRGB version of this image, Rich Richins was generous enough to offer his OIII data for me to add to my image. Rich had some very good data that happened to be taken with the same lens, so the field of view was quite similar. I was very happy with the extra punch that the OIII data provided, as it creates a beautiful contrast to the Ha within each of the two main nebulae.